After looking through this couple's photos for today's post, I'm pretty sure I've found the happiest couple ever! These two, y'all... They are the best. I've never seen a happier, smilier, laughier (not words, but you know) couple on their wedding day! This wedding was truly special, with a creative theme, unique details, and a super fun party for a super fun couple! Brittany and Skyler are one of our out of state couples, and we loved planning their wedding with them! These photos are by Britney Williams and Erin Fletcher at Sky Touch_e_photos, and they are beautiful and so dreamy! Brittany and Skyler were married at The Barn at Twin Oaks Ranch on April 23, 2016. Their color palette was full of deep reds, raspberry and dark green. "Getting married in the spring, most people automatically think of pastels, but I am just not at all a huge fan of them," Brittany said. "My favorite colors are deep reds and greens, which are completely winter colors. When I mentioned this to our wedding team, I was expecting them to talk me out of it... but they immediately just started talking about wonderful ideas to make those colors come alive at an outdoor spring wedding. And they did it in the most beautiful ways!" The theme of their wedding was inspired by the outdoors, with a natural, wild beauty and plenty of details that were a nod to both of their home states. "Skyler was born and raised in Louisiana and grew up fishing and playing in the bayous and swamps," Brittany said. "I grew up in Arkansas and love the mountains and outdoors. We decided we wanted to capture both of the atmospheres that we love so much and bring them together." Y'all, we love wedding videos... Like, LOVE them. Brittany and Skyler's was by Phillip Young, and it was exceptionally beautiful. It captured all the details of their day, as well as their emotions, excitement and all the unforgettable moments. There is no better way to remember your wedding day than with a beautiful video! Their bridal party looked incredible! Classic and so, sooo pretty. The bridesmaids wore floor-length, deep red gowns from David's Bridal, and the groom and his guys wore gray tuxes with red vests and bow ties. The flower girls were the sweetest things ever, in traditional white dresses and tiny little floral crowns! Oh, and those groomsmen... They sure were fun! One of the highlights of all weddings at The Barn: the flowers, obviously! Once again, our team designed some seriously stunning bouquets and arrangements. I'm not even going to pretend to know what these flowers are, but they are amazing! The rich shades of red and raspberry are certainly not things that are requested often, which is exactly why these bouquets were such a breath of fresh air. LOVE them! Brittany and Skyler chose not to see each other before their ceremony, but Brittany did have a first look with her parents. What a special moment for all three of them! Brittany and Skyler's ceremony decor was unlike any we've ever done! Their Louisiana-inspired details were soooo pretty. They brought cypress knees from the bayou and Spanish moss from a park in Baton Rouge to use in their ceremony and reception decor, and it was uniquely pretty! Their altar was wild and beautiful, with flowers in the most beautiful shades of red, lots of greenery, and Spanish moss. Their aisle was lined with the cypress knees, which were topped with more beautiful florals and Spanish moss. Brittany's favorite memory from her wedding day was her ceremony, and I can see why! There were literally over 100 photos of her and Skyler smiling their faces off as they tied the knot... These two were SO pumped to marry each other! "Looking into Skyler's eyes and marrying him, I will forever treasure that moment," Brittany said. "We both had so much fun getting married, and we still talk about it now. Everything, from walking down the aisle to him to saying our vows and planting the tree... and of course kissing my husband for the first time! Every second was perfect." This groom, y'all... All the feels! Brittany and Skyler had a unity tree planting ceremony instead of a traditional unity candle. One of the coolest unity candle alternatives ever! After their ceremony, the newlyweds took a few photos together before heading over to The Barn for an unforgettable night of fun and dancing with their guests! Brittany and Skyler's reception details were one-of-a-kind! Our team brought the same wild, natural, Louisiana-inspired details from their ceremony into The Barn for their reception. "We loved the Spanish moss hanging from the chandeliers and around The Barn," Brittany said. "It was so romantic and so us!" Their tables were full of colors inspired by nature, cypress knees and Spanish moss as well. It all looked incredible with our mismatched vintage glassware and their purple and gold place settings! Brittany's favorite thing about getting married at The Barn: "Definitely the all-inclusiveness of it," she said. 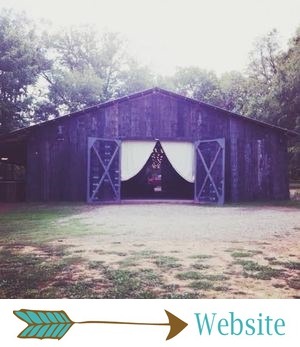 "Everyone was so wonderful and helpful, and not having to worry about ANYTHING made getting married at The Barn priceless." My favorite detail of Brittany and Skyler's reception was their amazing cake table! Their naked cake, topped with bold red and raspberry flowers, was stunning, and the rustic wood backdrop and Spanish moss couldn't have been more perfect! Another fun, creative detail from this wedding: the favors! "Our dream team came up with the brilliant idea of giving out tree saplings as favors," Brittany said. "We had cypress and dogwood saplings. It matched our theme perfectly!" This reception was full of special details that were a tribute to the couple's upbringing, including a Second Line into the reception to start the party! "This is an old New Orleans tradition associated with both weddings and funerals," Brittany said. "A brass band with drums usually leads the line with the bride and groom dancing after holding hand-decorated umbrellas. The wedding party and family come after them, and everyone who attended is welcome to join in as they go by. Everyone grabs a white napkin to twirl in the air as they dance to 'drive away evil spirits.' It is basically just an amazing impromptu parade!" Brittany and Skyler spent the rest of the evening dancing and celebrating their marriage with their family and friends. These two and their guests were so fun! After their big day was over, Brittany and Skyler made their grand exit and headed off to Costa Rica! "We stayed at an all-inclusive resort, so we were able to relax and regroup, but we were also able to rent a car and go explore the rainforests as well!" Brittany said.